Addition & Subtraction just got a lot more interesting! 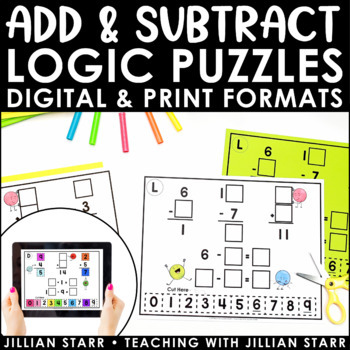 Grab this CLASS FAVORITE for your math centers! These 12 activities challenge students to combine logical problem solving skills with their knowledge of addition and subtraction facts. Using 10 tiles (numbered 0-9), students will fill in the missing parts and wholes to make 5 correct addition and subtraction sentences per page, but using each tile ONLY ONCE! 1) Copy Ready Pages for individual student use: Numbers 0-9 are located at the bottom of each page. Students cut out the numbers and glue them onto each activity page once they have solved the puzzle. This is a great option if you are looking to have a record of student work. 2) Reusable for classroom use: Simply laminate or put in pocket protectors to use over and over again. 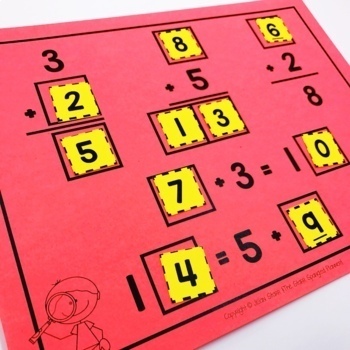 There is a separate page of sets of number squares 0-9 for laminating and repeated use.